Anyone who knows me in real life will be absolutely shocked by this post. I have stuck to my goal of cooking with my children for 3 weeks in a row!!! It is my goal to bake/cook WITH them involved, every Thursday. I began 3 weeks ago when we all made our favorite blueberry muffins together. This was something we had all made before so it was pretty easy. The hardest part was involving and managing all 3 of them ;-). The following week I completely forgot to plan something and while at Whole Foods I glanced over and saw this… Yup, you guessed it! We made pumpkin pie! I have NEVER made a pie-not even one this simple. But we did it , it was easy,and it was YUMMY!!! Pac was still a bit sick so he didn’t help much, but Krash helped me flatten the crust and mix! They came out beautifully and looked exactly as they did in the picture on the recipe-a miracle for me! Pac Man doesn’t really like them-too pumpkin spicy for him. Krash likes them and Ladybug LOVES them! 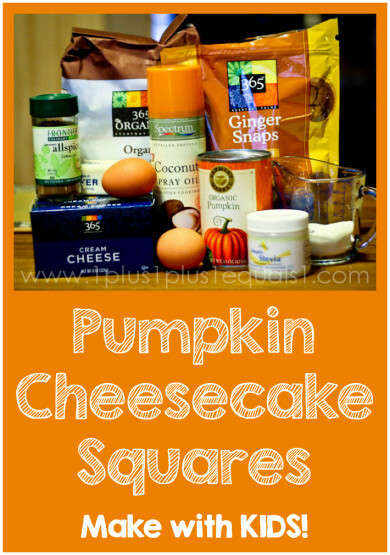 I am not a big pumpkin fan-but I AM a cheesecake fan so I love them! I am really glad I am stepping a bit out of my cooking comfort zone, it is nice. I pray I will stick with this-I actually don’t think the children will let me stop.